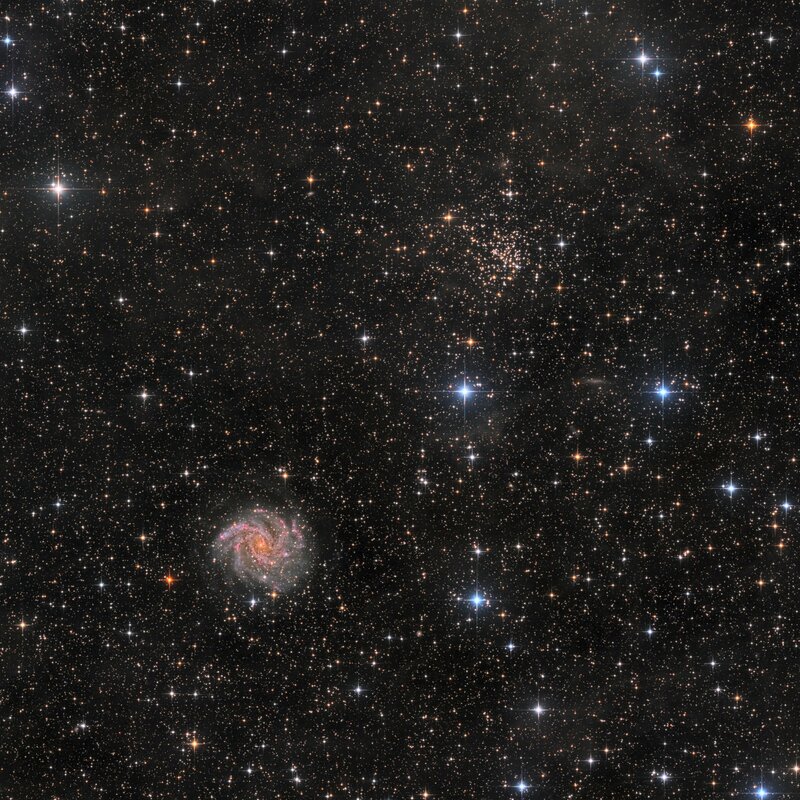 NGC6946 is a face-on intermediate spiral galaxy with a small bright nucleus, located on the boundary between the constellations of Cepheus and Cygnus. Its distance from Earth is about 22.5 million light-years. Discovered by William Herschel on 9 September 1798, this well-studied galaxy has a diameter of approximately 40.000 light-years, about one-third of the Milky Way’s size, and it contains roughly half the number of stars as the Milky Way. Due to its prodigious star formation it has been classified as an active starburst galaxy. In the past century, eight supernovas have been observed to explode in the arms of this galaxy, attaching weight to its nickname of the “Fireworks Galaxy.” The galaxy is heavily obscured by interstellar matter as it lies quite close to the galactic plane of our Milky Way. Appearing in the same field, just 40′ northwest of NGC6946 you find NGC6939, a dim open star cluster. The cluster lies approximately 4.000 light years away and it is over a billion years old.